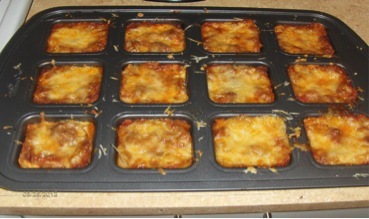 Another Brownie Pan Recipe – Mini Lasagnas!!! I absolutely adore the new Pampered Chef brownie pan. If you tried these fun recipe – I know you would love it too!! Cheese – use a combination of Mozzarella and Cheddar or whatever you want! Brown your hamburger. Put a small spoonful of sauce in the bottom of each Brownie Pan well. Shake pan to spread sauce around. Break apart the lasagna noodles. Chances are, you will only get one perfect square out of each noodle, but don’t throw away the broken pieces! You can still use them! Just piece them together to make a layer! Place a layer of broken noodles on top of the sauce. Then add a small amount of burger. Mix the egg, ricotta, and Italian seasoning. Place a dollop of mixture on top of burger. Top with another layer of noodle. Press down on the top layer of noodle. You need to have enough space to put another layer of sauce. The no-boil noodles require the moisture of the sauce so you don’t want to skimp on it! Fill the well with sauce. Cover with foil and bake at 350 for 25-30 minutes, until the noodles are soft. Top with cheese and bake an additional 5 minutes to melt the cheese. And that’s not all – I have many recipes that are for breakfast too! Yummy!! I love this new brownie pan – it’s so versatile. This entry was posted in Pampered Chef, Recipes, Recipes - Main Meals and tagged bake, beef, brownie pan, cheese, Cook, hamburger, lasagna, lasgna, mini, pampered, Pampered Chef, spaghetti sauce by tiannafonz. Bookmark the permalink. Wow! The look of these mini-lasagnas looks has a mouth-watering look to it. Thanks for posting info on this recipe.